We are proud to announce that the “Toolkit for the Indicators of Resilience in Socio-ecological Production Landscapes and Seascapes (SEPLS)” has been published and was officially launched at an event on 17 November 2014, held parallel to the IUCN World Parks Congress 2014 in Sydney, Australia. The Toolkit is a major output of a IPSI Collaborative Activity carried out by UNU-IAS, Bioversity International, UNDP-COMDEKS, and the Institute for Global Environmental Strategies (IGES). This project was a continuation of a previous Collaborative Activity by UNU-IAS and Bioversity International, in which the Indicators themselves were developed, and included a revision of the Indicators based on their field-testing and application around the world over the past two years. The revised Indicators and a manual for their practical application in the field have now been compiled into the Toolkit publication. The toolkit is divide into four chapters, first familiarizing the reader with the relevant concepts of resilience and socio-ecological production landscapes and seascapes. 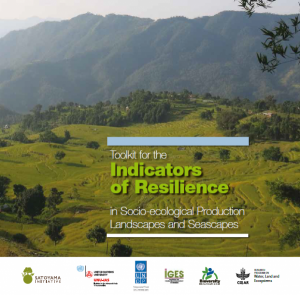 It then introduces the set of 20 qualitative and quantitative indicators designed to capture key aspects of a system – ecological, agricultural, cultural and socio-economic, based on observations of the communities themselves, and also provides practical tips for organizers and facilitators of workshops to assess resilience, and gives further support through examples from the field featuring Namibia, Fiji, Turkey and Kenya.